Oil on board, 6" x 6"
This time of year the evergreen forests provide a beautiful deep green foil for the golden cottonwoods. 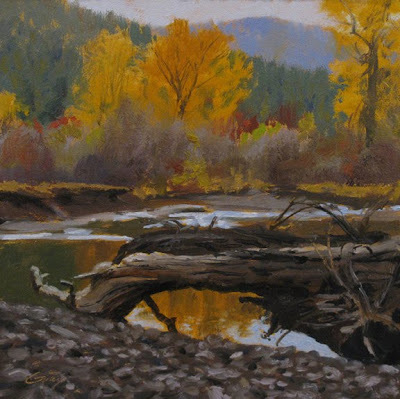 Catherine Creek trickles along so quiet and gentle these days--it's hard to recall the raw power it displayed in springtime, when it tossed these large tree trunks up onto the gravel bar like pick up sticks. I love this piece, Don. The composition and color are wonderful! Keep up the great work. It's a real beauty Don. Sheila, good to hear from you--thanks.